Daisen G Weizen is a 5% German hefeweizen from Kumezakura Shuzo, based in Tottori, Japan. It’s part of their all-year round range of beers and can be found in both bottles and on tap across Japan. It’s also an award-winning beer, having won a couple of medals at the International Beer Competition, which we’re not too sure of what it is and now we think it’s too late to ask as well. Like other companies in Japan, Kumezakura Shuzo also advertise this beer as being suited to women….why oh why do companies do this?! Popular with women…but don’t let that stop you. First I felt irked by the notion that weizens are suited to women – I love a good weizen and will happily drink a fair few in the summer months to quench the thirst as I find the crisp bananary taste does a great job in doing that. Secondly, I felt triggered by that fact that someone in this age could advertise a beer towards a certain demographic and ignore my gentler side. Who am I kidding? I couldn’t have cared less but still, it’s a bit weird how breweries advertise to one demographic and ignore the rest when it comes to beer. 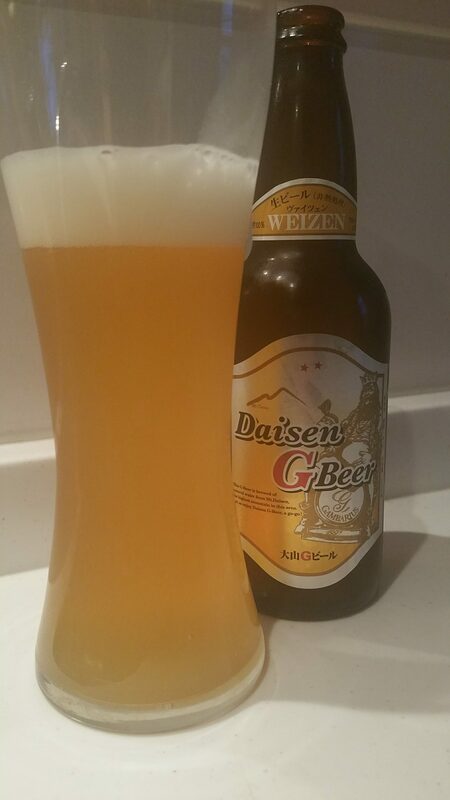 Daisen G Weizen poured out a hazy golden straw colour with a frothy white head on top. It had a pungent banana and clove aroma. In fact, it smelt like what a prototypical weizen should smell like. It wasn’t extraordinarily over fruity or spicy either. There was some hint of wheat in the backend with it balancing well against the other aromas. The only downside would be the pink bubblegum aspect to it – still can’t get used to that aroma in a beer. It had a light body – which would have been great for summer if I could have waited that long, but alas, after a hot spring day (22c!!) my thirst need quenching. It was crisp, with a lemony bite, and with the banana and cloves flavours swirling around, Daisen G Weizen proved itself to be easy-drinking too. As it warmed up, Daisen G Weizen was a tad rough around the edges but still easy enough to drink. It ended up with a sticky banana residue on the palate that faded fast. I’m gonna say it – I loved Daisen G Weizen and would happily drink a lot more of it. And I don’t care if I’m not the target demographic, it’s good and I want more.